Still bitter about HD DVD? We knew it was coming, we just didn't know when. Toshiba's announcement of the P500 Blu-ray laptop and BDX2000 standalone player weren't surprising and neither was the underwhelming and rather resigned nature in which the new kit was introduced. Olivier van Wynendaele, Assistant General Manager, Toshiba Information Systems managed to give the simultaneous impression that Blu-ray was both something here and now, while also making sure everyone knew that Tosh really wasn't that content about succumbing to the world of Blu. 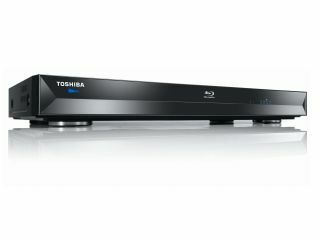 "We believe that the market for Blu-ray players will be mature in 2010," asserted van Wynendaele in an attempt to dispel any thoughts about Toshiba's late and distracted arrival to the market. "Blu-ray delivers on its promises now," he added. "We have customers... who we need to give an answer to bring this player to consumers." And then, as soon as he'd bigged it up, van Wynendaele attempted to say that Blu-ray is just a stepping stone to new services. "Also we believe that Blu-ray... is a transition to the next generation of devices... and services. Of course Blu-ray is not the only [solution ], you have alternatives... like SD card, hard drive and online distribution now." However, van Wynendaele had to admit that Blu-ray is currently where it's at for HD. "You will see in the near future features coming through the Blu-ray devices and it's important that Toshiba will bring this to our customers, too," adding "when it comes to the ultimate Blu-ray experience, Blu-ray delivers a stunning solution." However, the best line was reserved for the BDX2000 press release which says "this product does not play HD DVD discs" at the bottom. Just in case you were wondering.